Two local teams competed at the Oshawa Regional FireFit Competition last week. Squads from North Huron and Huron East attended the event which ran Aug. 25-26. The competition challenges firefighters to, in full bunker gear, complete speed-, skill- and strength-based challenges mirroring obstacles firefighters might find in the course of their duties. 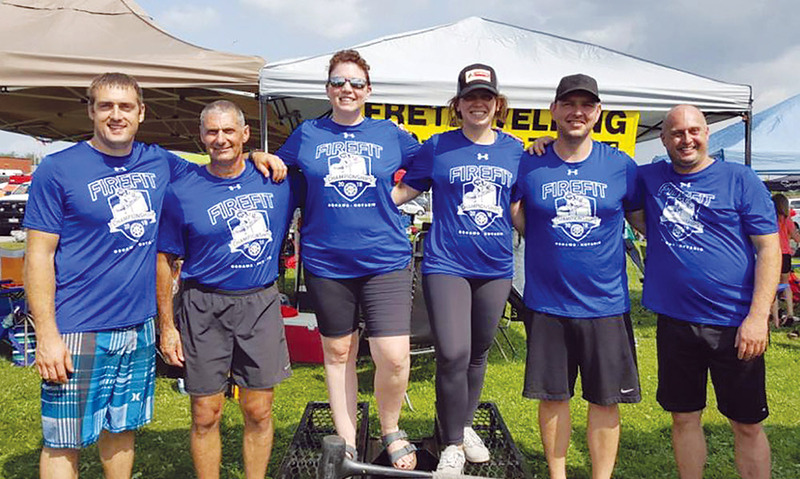 Huron East’s squad included Chris Gibson, who placed 29th out of 140 men and fourth for volunteer firefighters with a time of 1:33.99, and James Yates who finished sixth for men over 40 with a time of 2:56.58. North Huron’s competitors included Amanda Bekkers, who posted a time of 4:44.61 (51st in the volunteer category and 19th in the women’s category), Dan Ryan with a time of 2:45.46 (43rd in the volunteer category and 42nd in the rookie category) and Alain Dery who ran 2:13.88 placing fifth in the Over-55 category and 26th in the volunteer category. Both squads fielded teams in the mixed relay race and Gibson and Yates placed eighth out of 20 teams in the X3 relay with a time of 1:48.27.